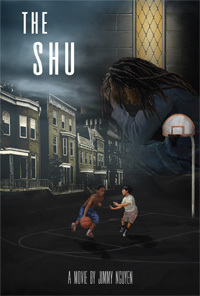 Movie Synopsis: The community of Kings Park in Springfield, Virginia is just like Any Suburb, U.S.A. Uniformity and familiarity prevail as you pass through the neighborhood up until you spot the 30-foot golden statue rising up from behind a house. That house belongs to Michael Meredith, a general contractor, part-time sculptor, and unconventional suburbanite. The documentary is a light-hearted history and exploration of the eponymous statue and its creator and the reactions they get from neighbors, aspiring artists, and commuters, who are witnesses. Making the movie (spoiler alert, read only after watching movie): Who doesn’t love listening to This American Life and the extraordinary stories they tell of “ordinary” Americans? Some of my favorites episodes are Superpowers, DIY, My Experimental Phase, and of course, Home Movies. 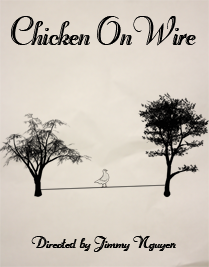 These stories tell of people engaging in activities that range from the remarkable (spending decades trying to get your best friend out of prison) to the whimsical (a boy trying excitedly to find his superpower) and they are all very approachable. So much so that it kind of inspired me to go out and make a documentary about something in my immediate world. Well, there was no better subject or less subtle one than the 30-foot statue that stood 5 minutes from my house. I am being a bit bold when I say that the large statue was an obvious choice for me because in reality it was my wife who told me about the statue even though I had probably driven down Southampton Drive, where the statue stands, more than a dozen times without seeing it. After my wife’s half-hearted attempts at explaining to me what I should be looking for and where, I rode down the approximately 2 mile drive several more times and still didn’t spot the statue. Our roommate at the time came home one evening and exclaimed that she had indeed seen the statue with her very own eyeballs. I felt the same type of dread when those Magic Eye posters were popular, which is to say not much. I can be patient for these magical moments. I wasn’t going to sweat it. Okay, maybe I was a little jealous. To be honest, I don’t remember the first time I saw the statue or what I was thinking. Like a good speech, I just remember a general feeling of what or how it transpired. It was a mixture of excitement at being in on the open secret and visual pleasure at the otherworldliness of the whole thing. At first, selfishly, I thought of how I could use the statue in a movie. The backyard where the statue stood could be the meeting place for a scene that involved an avuncular figure dropping wisdom on a young man. Nothing too exciting. Some simple conversation to contrast the outlandishness of the statue that would be lounging in the background. Indeed I think when I first met Erika Meredith, the statue creator’s wife, I told her I wanted to use the statue as a prop in a fictional narrative movie not as subject for a documentary. The way I met Ericka was quite memorable. The statue had disappeared for a couple of weeks. It was gone and I wanted to know what happened to it. One evening, my wife and I were driving down Southampton Drive and we saw a petite lady with jet black hair sweeping the driveway of where the statue used to cast a shadow. For no particular reason, I stopped, rolled down the car window, and yelled from the other side of the road, “What happened to the statue?” at the petite lady who I assumed lived there. After some brief attempts at conversation through yelling, she gave up and waved us over to come chat. It turned out that the statue was just being improved upon and that it was still in the backyard, but suspended horizontally face down 2 feet off the ground. I was relieved. Conversation quickly turned to other things and it was immediately obvious that Erika was a very charming, talkative, gypsy of a woman from Chile. 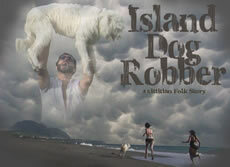 It was meeting Erika that lead me to believe there was potential for a documentary here. I thought if Erika is this interesting, imagine how captivating her husband would be on camera. What about their relationship? Where does the golden statue come into all of this? Then there are the neighbors and commuters who are co-conspirators. All the ingredients were there for a great documentary. I didn’t actually get to meet Michael the day I met Erika. He was at work and I left Erika my number. I was surprised when he called me later that night to discuss a possible meeting. At the time, I guessed I had made a good impression on Erika, enough that she delivered my number to Michael. Later on, I recognized that it was just that Erika loved talking to people and meeting new friends and that she welcomed all story-seekers into her world. And there are many reporter/journalist types stopping by the Meredith’s home seeking stories. I visited with Michael one or two times before I got a call from him one day telling me that he was going to lift the statue back up over the weekend and that I should come out and get footage of it. I was excited because the raising of a 30-foot golden-faced statue only happens on a few occasions in life. Moreover, I was waiting for the statue to be completely erect before I interviewed Michael because it is the natural backdrop for the interview. The morning of the raising, I made sure to grab lots of tape because I knew from experience that when you get Michael talking, it flows for a long time. When I arrived at Michael’s house, I was pleasantly surprised to see that Michael’s neighbor, Alex, was helping him raise the statue. Alex is from Central America and is gracious enough to let Michael keep several ropes tied to his tree in his backyard. The ropes help support the scaffold that supports the statue. Indeed they don’t make neighbors like Alex anymore. I mean I take a blowtorch to any limbs reaching over into my yard from a neighbor’s tree. More than gracious, it seemed Alex was happy to do the physical labor of cranking the ropes to make the statue rise again. After the statue had been fully raised, it was nice to be witness to two neighbors bonding as a golden taciturn face looked down upon them. Alex seemed appreciative that the statue was back up and that he had helped. After Alex left to attend to his own business, I interviewed Michael. The interview went okay. In the interest of full disclosure, I never am too happy about any video shoot or interview after it is over. There is always the dread of not capturing the true feeling of the moment and having to settle for mediocre footage. However, this time around I really felt that I had let a golden opportunity slip away. I felt I allowed Michael to wander too much from the interview questions. I felt I was too passive and that it would be a nightmare editing together these long speeches Michael was giving about anything and everything but the statue. I felt my footage was too overexposed and underexposed. I felt I was sniffling too much and that the repeated sucking-in-of-snot noise would be all over my audio. I felt all this even without looking or listening to any of the footage. And it stayed this way for 2-3 months after my interview with Michael. Yes, this is childish. I was too scared to look at my footage because it might not be perfect enough. The footage was so beautiful that I proceeded to let it marinate for a few more months. Then I started to make another movie, Warm Clothes, which took up a few more months of my time. When I finished editing Warm Clothes, I picked an arbitrary date to have a movie premiere for it. But then I thought, why not make the premiere a double feature by also showing the Golden Mother documentary. 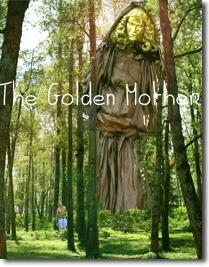 So a week before the movie premiere, which took place on May 28, I decided to finally start editing the Golden Mother documentary. 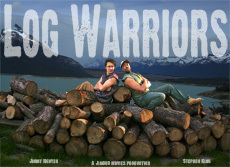 I finished the documentary at 3 a.m., the morning of the movie premiere, which is similar to how I finished Log Warriors. The evening of the movie premiere, I finally showed my movies, drank champagne, and enjoyed the night with my friends in attendance, who also included Michael and Erika Meredith. Cheers to the people who make life worth recording. – I wanted to interview Erika for the movie, but she got camera shy. How unbelievable for such an outgoing lady! I think she just wanted to keep the spotlight on her husband, Michael. How sweet! – Another big regret was not getting an interview with Alex, the neighbor, who seemed to be leading me on. He would agree to an interview, but never give me a time when I could come over. – The car crash scenes were shot on the same Southampton Drive where the golden mother is located. In fact, the car crash site was only a block or two from Michael and Erika’s house. And no, the scene where the driver passes the car accident and takes a picture was not planned. Interesting stuff seems to happen on Southampton. Did you know Macho Man Randy Savage was also born on that street? – Surprisingly, the neighbors that I talked to, some of whom have lived near Michael and Erika for years, don’t have the slightest idea of what the statue is, means, or much about Michael himself. In the suburbs, people stick to themselves and sometimes those blinders that they put on are very narrow. And eventually, their peripheral senses goes blind like a lazy eye.